Previously, astronomers had estimated GN-z11's distance by analysing its colour in images taken with both Hubble and the NASA Spitzer Space Telescope. Now, for the first time for a galaxy at such an extreme distance, the team has used Hubble's Wide Field Camera 3(WFC3) to precisely measure the distance to GN-z11 spectroscopically by splitting the light into its component colours. "Our spectroscopic observations reveal the galaxy to be even further away than we had originally thought, right at the distance limit of what Hubble can observe," explains Gabriel Brammer of the Space Telescope Science Institute and second author of the study. "We've taken a major step back in time, beyond what we'd ever expected to be able to do with Hubble. We managed to look back in time to measure the distance to a galaxy when the Universe was only three percent of its current age," says Pascal Oesch of Yale University and lead author of the paper. Before astronomers determined the distance to GN-z11, the most distant measured galaxy, EGSY8p7, had a redshift of 8.68. Now, the team has confirmed GN-z11's distance to be at a redshift of 11.1, which corresponds to 400 million years after the Big Bang. 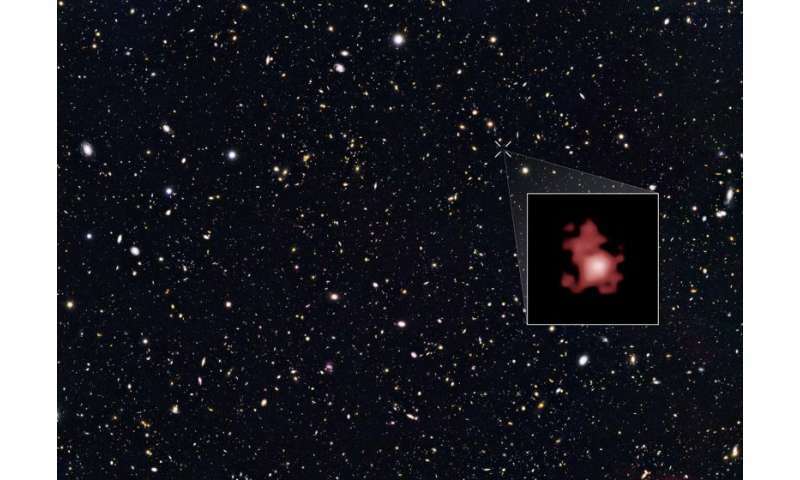 "The previous record-holder was seen in the middle of the epoch when starlight from primordial galaxies was beginning to heat and lift a fog of cold, hydrogen gas," explains co-author Rychard Bouwens from the University of Leiden, the Netherlands. "This transitional period is known as the reionisation era. GN-z11 is observed 150 million years earlier, near the very beginning of this transition in the evolution of the Universe." The combination of observations taken by Hubble and Spitzer revealed that the infant galaxy is 25 times smaller than the Milky Way and has just one percent of our galaxy's mass in stars. However, the number of stars in the newborn GN-z11 is growing fast: The galaxy is forming stars at a rate about 20 times greater than the Milky Way does today. This high star formation rate makes the remote galaxy bright enough for Hubble to see and to perform detailed observations. However, the discovery also raises many new questions as the existence of such a bright and large galaxy is not predicted by theory. "It's amazing that a galaxy so massive existed only 200 million to 300 million years after the very first stars started to form. It takes really fast growth, producing stars at a huge rate, to have formed a galaxy that is a billion solar masses so soon," explains Garth Illingworth of the University of California, Santa Cruz. Marijn Franx, a member of the team from the University of Leiden highlights: "The discovery of GN-z11 was a great surprise to us, as our earlier work had suggested that such bright galaxies should not exist so early in the Universe." His colleague Ivo Labbe adds: "The discovery of GN-z11 showed us that our knowledge about the early Universe is still very restricted. How GN-z11 was created remains somewhat of a mystery for now. Probably we are seeing the first generations of stars forming around black holes?" These findings provide a tantalising preview of the observations that the James Webb Space Telescope will perform. "This new discovery shows that JWST will surely find many such young galaxies reaching back to when the first galaxies were forming," concludes Illingworth. The red shift indicated the recession speed, the distance came from applying the Hubble Constant. Which Hubble Constant did they use, the one derived from the speed and distance relationship nearby to the Milky Way or the new Hubble Constant that Saul Perlmutter claims to have "discovered" from, apparently, studying only one galaxy, the Constant that comes from the universe having started to "accelerate" five billion years ago? Which Hubble Constant did they use...? wow... if only there were a means of accessing the study they published to find out! what to do... what to do...i mean, without a means of finding the TARGET SELECTION AND DATA, discussion, summary or reading the math or arguments, we are stuck speculating on what they really mean in the article! ...OR... until we can see their graphs, supplemental data, work, references and all that... what can we do? IF ONLY THERE WAS A WAY to see all that!! What happens when JWST finds galaxies before the Big Bang? Indeed. The merger maniacs must continue to patch. However, the discovery also raises many new questions as the existence of such a bright and large galaxy is not predicted by theory. "How GN-z11 was created remains somewhat of a mystery for now. Probably we are seeing the first generations of stars forming around black holes?"" thanks for he comments! Another 4 people made it to the ignore list. It's not that I don't believe you all have a better explanation of the birth of the universe than those pesky mainstream bingbang theorists but...well actually I do. This was past not present. I have some cosmological questions I hope someone can help me with. Given that every one of the thousands of the tiniest specks in the Hubble Ultra Wide Field pics is a galaxy, and that the entire HUWF is a very tiny speck in the entire sky, specifically chosen because it looked empty in prior pics, how do they pick a particular speck to zero in on? If they can only determine a distance by red shift of their spectrum, and have to pick it first to get that, are they are about to find galaxies that are not possible according to Big Bang theory? They keep pushing the limits of how early galaxies could form, and they've only looked at a vanishing small % of the tiniest specks they can detect. Unless they examine a much larger random sample and find they all conform to the theory of when they could form, either the time of the BB needs to be pushed back, or there's a flaw in the math. @taa, actually they are aware of the differences in the time frame, but what is being said is that the light image we have Now from Back Then is doing (X) Now in our time frame. So, it is like we get to watch a recording of that time frame, but since we cannot back it up, we have to base our observations on what We can See Now. Should they find galaxies that are further back in time than the BB then they will just have a conference and reset the time frame of when the BB happened, this has been done before; just move back the time of the BB by a billion years of so to make their observations come out better. It would 'answer some of their questions' such as why there were galaxies that size at only 2-300 million years into the Universe age. Eventually they will find it is all just fractal iterations, no matter the scale, things are essentially the same and composed of smaller particles yet. Protons as galaxies, globular clusters as electrons or maybe the quarks forming them. The galaxy is (was) forming stars at a rate about 20 times greater than the Milky Way does today. This high star formation rate made the remote galaxy bright enough for Hubble to see and to perform detailed observations.. The fast formation rate is the reason that this particular galaxy is detectable at this distance. Eventually, more typical galaxies with slower rates will also be detected with larger scopes, causing great consternation for the merger maniacs, who must then come up with yet another patch for their precious explosive fantasy model. The mainstream silence is deafening. What is the furthest away galaxy that is observed to have blueshift? "So, in a nutshell, if a galaxy's peculiar velocity is toward us and larger than its Hubble recessional velocity, then its light will appear blueshifted." "There are about 100 known galaxies with blueshifts out of the billions of galaxies in the observable universe. Most of these galaxies are in our own local group, and are all in orbit about each other. " Do you have any counter example? Why not saying that Z=11.1 is equivalent to a distance of ~13.4 billion l.y. ? IMHO it is not the most remote galaxy discovered. Campagne 2012 HUDF show z=11.9. EGSY8p7 is not the 2d farest, it is MACS0647-JD discovered in 2013 with z=10.8. Readers can be surpised by some redshifts higher than 11.1 in other galaxies and not taken into account. Most of them are "photometric" redshift, so based on photometric measurements. These data are much less accurate than the usual spectroscopic measurement of bright lines performed with high resolution spectrometers. Therefore all papers listing photometric redshift are never as watertighted as spectroscopic data, what explain that astronomers do not consider them as authentic or valid redshifts. To be fair though this measurement is still controversial. There were no lines detected in the low quality spectrum. Only a break which the authors believe is a lyman break. Not helping their case is the fact that the photometric redshift was much less than there new redshift. While photo-z's are not as precise they are usually good for lyman break galaxies. Which is why I'm saying, the red shift isn't result of scattering of light waves at small but permanent particles, like the sunset. This idea was already dismissed by Zwicky, who tried to apply it for explanation of his tired light hypothesis. But the vacuum is full of quantum fluctuations, which may act in similar way, like the Brownian noise at the water surface for scattering of surface ripples. These fluctuations are quite large, but very temporal - they disappear faster than the single period of light wave, so they cannot lead into spectrum cutoff. Brownian noise.. water surface... surface ripples.. Only left out one "water strider" analogy. This same crackpot has been posting this garbage for 2+ years under literally dozens of different names. You can safely add this person to your ignore list if you haven't already. I like the approach. Keep it coming. It's Zephyr. re-re-re-re-re-re..umpteenth-reregistered after getting re-re-re-re-umpteenth-re-banned. Don't hold your breath how long this particular sockpuppet will last. Just sticking scientific sounding words in a post doesn't mean it's scientific (neither does it make one knowledgeable...or smart). Zeph is just trying to obfuscate. But he doesn't realize that anyone who actually understands what these words mean IS way smarter than him. Hence his continual bafflement at why no one takes him seriously. The mainstream "theory" of redshift being "evidence" that actual space is expanding is at odds with any distant object being blueshifted. Or any light that is not redshifted. I repeat. " if a galaxy's peculiar velocity is toward us and larger than its Hubble recessional velocity, then its light will appear blueshifted." I really can't make it any simpler. What you're saying is absolutely false. That's why we only measure blueshifts for some (emphasis) galaxies close (again, emphasis) to us. A counter example when you just provided a quote demonstrating what I am saying? Congrats. There's blueshift. Doesn't support your conclusion. Woah, a more interesting question. What is the frequency of the redshift of the suns light? Quick running some math, I get an answer of z = .0001. So the frequency should be red shifted by .01%. ...That's why we only measure blueshifts for some (emphasis) galaxies close (again, emphasis) to us. This would suffice as a counter argument except that we assume that IF a galaxy is blueshifted then it 'must be closer'; and IF it is redshifted it's 'much farther away'. This is circuitous self-selecting logic. I predict that we shall find galaxies much farther away, which will shatter the idea of a Big Bang. What good is making such an assertion? So you take your pick. Your either dumb or dumb and lucky (and given the current state of knowledge you're just dumb). Ya didn't get the memo from LIGO, apparently. Gravitational waves travel at c (as predicted. See - they actually provided some evidence. That's how it works.). But it wasn't. How do you think the redshift distance relation was established in the first place? Other distance measures, the distance ladder. In the case of Hubble Cepheids were used which were directly calibrated from parallax. Each method is calibrated off a well understood one. the distance is dependent on series of 'steps' that are 'wonky' with problems. Despite the name you to not go from one method to the next, and so on. The standardisable candles you refer to, SN-1a were only used to calibrate the Hubble diagram at high redshift. They are not used to establish the Hubble law in the first place. Criticising them doesn't call into question the Hubble law. You're attacking something you don't understand. Hi Phys1. :) Their apparent diameters are useful if they are very close. That is not at issue. It is the farther galaxies in question. This 'size' assumptions/interpretations have been recently compromised by mainstream astronomical discovery that many galaxies extend way beyond the previously visible image 'size' would indicate. Like I said, each step in that 'ladder' is fraught with assumptions and problems which more recently have been exacerbated by recent discoveries that previous 'standard candle' etc 'steps' are not as standard as previously assumed. OK, what assumptions go Cephids for example which actually affect the results? And their mass/redshift 'estimates' are still in 'flux' because observed behavior didn't match the 'spectral' info 'rulers' used so naively before. Wiki: "Several problems complicate the use of Cepheids as standard candles and are actively debated, chief among them are: the nature and linearity of the period-luminosity relation in various passbands and the impact of metallicity on both the zero-point and slope of those relations, and the effects of photometric contamination (blending) and a changing (typically unknown) extinction law on Cepheid distances"
See? As 'distance markers' they are vulnerable to variable local conditions within and around the stars involved; just as recently found for previously 'standard' Supernovae Ia. None of those are caused by "a-priori assumptions", those are just observational aspects which can be overcome. They can also be estimated in systematic uncertainties. What assumptions affect the measurements of Cepheids? revious assumptions re galaxy size, luminosity, mass etc. Now changing. You said redshift estimates are in flux. How so? None of those affect a spectroscopic redshift. ...seems that others have already beaten me to it why your 'prediction' is nonsense. So yeah: they should prepare. If ever there was a theory that needed space in the circular file it's yours. If there is something wrong with the various methods to determine distance, the astronomers would find out AND publish long before you. Have you forgotten my caution to you some time ago to eschew such 'certainty' attitudes which may be your blind spot when encountering a challenge to current cosmological BBang etc orthodoxy which is now under serious question/review on many fronts? As to mainstream finding and publishing a possible flaw in the current methodology/assumptions before me, it will have been because of people like me questioning/pointing out flaws. Those flaws existed/found by others too, before mainstream corrects itself. That's science. It's immaterial who finds/publishes it 'first'. Having said that, I now put to for your objective scientific consideration ONE OBVIOUS FLAW which seems to have been 'missed' by BBang etc cosmologists; a flaw which compromises distance/shift/imaging methods for galaxies such as in above article. - There is myriad material quantities in space which change the photonic characteristics due to absorption/re-emission/refraction etc etc. - There is myriad STARS, Planets and other radiating sources (albeit not individually discernible in their own right) whose own component of photonic radiations may align with and overwhelmingly add to and so contaminate any stream of photons headed to Earth from that 'farthest galaxy' along the line of sight. - There is no way of determining by spectroscopic or other current methods which of the individual photons building up an image in our telescopes came from (whether from an actual galaxy or from a line-of-site superposition/composition of individually too faint stars and other radiating sources). How the flatness of universe is supposed to contradict the tired light hypothesis? Here's a quote from the abstract: "An alternate cosmology, curvature cosmology, is in full agreement with the raw data." The 'raw data' doesn't include or address WMAP data, which shows that the universe isn't curved. It shows that our universe is quite flat, to the fullest extent that we can measure. Why isn't this basic data included? Because it's not in "full agreement"? You mean that there is a chance that you would find out before them? Have you forgotten that you are a scientific nobody? An easily settled matter, mate. I provided you with one obvious flaw to consider. Have you? If so, now point to where mainstream cosmological/astronomical physicists/theorists have corrected for that obvious flaw when making compiling an image of and making conclusions/claims about the above 'furthest galaxy'. That is as easily settled an issue as it gets. Just point to the scientific recognition of that flaw and the scientific allowances and caveats which any valid scientifc work should also caution may invalidate any conclusions/claims re shift/distance etc re that galaxy. Now I know you are not a scientist or serious about actual science. Your ego is getting in the way, obviously, or you would not have posted those last two dismissive comments which ignore the mainstream facts about what huge volumes of material and radiative/attenuation processes (stars, planets, dust, gases, plasma flows and magnetic fields) between us and that furthest galaxy. Your evasions/insults in lieu of science noted. As I said last time none of those are a "a-priori assumptions". You speak of contamination of a spectrum. That's not an issue in a normal spectrograph because all you get is a blended spectrum. It's quite easy to see if there is stellar light in there. Unresolved sources can be measured with sky statistics. That's what you measure significance of an observation from in many cases. Observers are perfectly capable of measuring background, everyone does it. You must show some evidence of any claim you apparently are trying to make. You don't have any. So stop bs'ing. And especially stop the sermons you have a habit to make. You are a crackpot, not a pastor. I made the one vote by mistake and I apologize for that. It should have been a five. Choot, it should have been more than five if they nice peoples at physorg would allow it. Yeah, sermons is what he does. He's been doing that for 10 or 9 years. He thinks he is the BIG CHIEF when it comes to telling peoples how to talk. Anyhoo, sorry about the mistake vote. I did not mean it. I was alluding BOTH to assumptions these 'ladder' methods are valid AND those assumptions based on 'confidence' levels regarding a-priori assumptions INHERENT to every 'step' beyond parallax method. As already explained. That's the point. The 'stellar light' and other radiation may NOT be from the galaxy, but be from myriad unresolvable intervening stars etc. And that intervening HUGE contamination is NOT 'background' but FOREGROUND in this case. You are obviously missing the specific points/logics. Amazing. I posted scientifically supported facts and they are labeled as 'sermons' by people who obviously haven't a clue what is mainstream science fact when presented with them. They call me names while ignoring what I said and then being embarrassed when they are proven wrong. These trolls never learn. They didn't learn from their Da Schneib fiasco; nor from their BICEP2 fiasco. Now they again make light of serious scientific discourse just because they 'believe' their own ego-games are more important than objective and scientific discourse on the issues not the person. We have the latest proof of this sad state of affairs just above. I accepted the challenge to post supporting arguments/facts about ONE obvious flaw in the current cosmological distance/imaging and claims/conclusions in the above 'farthest galaxy' case; and what is their reaction? They evade the science because they have nothing but personal beliefs/ego-games in lieu. No wonder science is in trouble. And that intervening HUGE contamination is NOT 'background' but FOREGROUND in this case. Completely irreverent. It is referred to as background, because it's the background sky on which you have your object. The image doesn't know which object is behind which, it doesn't matter. You've completely ignored the point I made and have instead retreated to semantics. This is a solved problem. If the contamination was "huge" you wouldn't detect the galaxy in the image in the first place because it wouldn't be significant over the sky noise. t is referred to as background, because it's the background sky on which you have your object. In the case of a FURTHEST GALAXY there IS NO 'backgound', since in that line of sight the ONLY 'background' is that 'furthest galaxy'. Do you understand this correctly now? Please drop your 'background' misunderstanding for your further rationale re this. Thanks. The image doesn't know which object is behind which.. Exactly! Thanks for 'getting it'. It doesn't actually 'resolve' ANY 'object', including that galaxy. It's only a composite image built up from individual photons which you just admitted have not been 'sourced' to any particular 'object' along that line of sight. As to 'significant', it's only an 'image' built from individual photons. If intervening photonic additions overwhelm photons from otherwise unresolvable galaxy then it's a line-of-sight 'artifact'. I have recently read your post telling of your lung cancer, and that prognosis is not good. Very sorry to hear it. I know what it's like to face life threatening illness, so you have my genuine and empathetic support in your fight against it. Good luck, mate. Knowing this, I am at a loss as to how you can spend your waning years/health/energy on downvoting my above post(s). Especially as, once again, I am the one bringing actual scientifically tenable arguments while being trolled by those same types who came a cropper when they trolled me in the past (Da Schneib and BICEP2 instances come to mind). If you didn't read my post above, please do so now, in context, and you will see I have met the challenge to present scientific argument in support, while others (except for IMP-9 who has stuck to science instead of trolling like the others involved) have not answered equally on the science. Why encourage such anti-science trolls if you are a science supporter? We're taking about imaging, you have a smudge on a CCD. You don't know where it is. You're contradicting yourself claiming to know this. And anyway, there will still be light from more distant objects, just unresolved. If intervening photonic additions overwhelm photons from otherwise unresolvable galaxy then it's a line-of-sight 'artifact'. The galaxy is resolved (This paper wouldn't exist if it wasn't). To resolve an object in photometry just means it is a statistically significant detection. That takes into account variations in the sky level. If the unresolved sources could overwhelm the object then it wouldn't be statistically significant because the sky noise would be higher. We're taking about imaging, you have a smudge on a CCD. You don't know where it is. That's the point I raised. The only claim that a 'furthest galaxy' has been 'imaged' is that 'smudge'; which I already explained could be an 'artifact' of sporadic 'individual' photons received being from Billions of LYrs of intervening space containing innumerable photon sources (stars/planets/dust etc). If this is the 'furthest galaxy', and if its photns are sporadically received individually here, then photons from even further sources would be overwhelmed even more so by intervening photons as I explained. No. That is 'confirmation bias' at work. Bear in mind that over such vast expanse, an 'image' constructed from sporadically received individual photons is ASSUMED to come from 'one object'. It may be a line of sight 'artifact', as explained. And I've told you several times your logic doesn't work, but you've ignored this each time. The variation in the sky level is not enough to cause a false detection like this in such a small field as GOODS. Whether or not an object is significant is determined by the error in its flux which largely comes from the sky noise in this case. Most of that sky noise is the zodiacal light but it includes unresolved sources. If unresolved sources could cause this detection they would cause higher sky noise elsewhere and so the object would not be significant. Please stop ignoring what you don't what to hear. Your idea simply doesn't work. They have spectroscopy. Read the paper. ASSUMED to come from 'one object'. No. That's not what resolved means. An object means some aperture on the image. I assure you I have not ignored anything you've said. That is a courtesy I extend genuine interlocutors; to listen and not just ignore and dismiss unargued. The whole point is that techniques used which you mention for 'sky noise' etc is not so dependable when treating vast distances/low photon counts. The techniques depend on algorithms and statistical averaging treatments which fail due to paucity of data points. This assumption of confidence in such supposedly dependable techniques was the starting point I originally raised when we spoke of 'distance ladder methodology' steps, remember? Just because the current method depends on the techniques you mention, it does not follow that those techniques are dependable, especially given the nature of the dataset being manipulated. We have few sporadic individual photons from vast distances produced by all sorts of processes/matter along line of sight. Sky noise techniques may produce 'artifacts' in such scenario. the reason: scientifically tenable requires (wait for it... WAAAAIT for it..) EVIDENCE! We have few sporadic individual photons from vast distances produced by all sorts of processes/matter along line of sight. Sky noise techniques may produce 'artifacts' in such scenario. What do you mean "we"? If I understand you correctly, RealityCheck, you don't know what you're looking at, and as far as you're concerned, it's a noisy photonic smudge of an artifact from you know not where. Thanks for your input. CapS. What are you on about now? Vietvet gave a '1' for my post where I was having a scientific discussion with IMP-9. I gave scientific observations and supporting science based arguments. I wanted to convey to Vietvet just how anti-science it is to downvote a science based exchange while encouraging with '5' those guilty of not discussing science and trolling instead. And, CapS, just because you don't understand the science/points/logics being discussed it doesn't mean you are free to demonstrate your ignorance, irrelevance and personal trolling crap like that....again. CapS, leave it out. You are not equipped for unbiased discourse. Go try to impress your fellows who are just as arrogantly ignorant and maliciously irrelevant and disturbingly 'personal' as you come across....again. Let the 'baggage' go, CapS. Stop your 'noise'. Leave the discussion to those who actually bring objective science not personal baggage. Thanks. RC, if you lack the smarts to understand, appreciate, and celebrate the new record, woe is you. having problems reading and comprehending basic English? perhaps you aren't able to read too well? that and because you can't actually validate your claims, which makes them opinion, not "scientific discussion"
any further questions that aren't already answered above? or are you gonna start whining and crying about how you're being victimized because of [insert lie here]?? This is the sort of naive and uncritical acceptance of conclusions/claims, 'just because' it's from a 'reputable mainstream source', that was so amply demonstrated in that BICEP2 case. Haven't you learned? Real science method is to question and challenge when the conclusions/claims seem to defy the realities of flaws and biases in any exercise which involves much analysis technique applied to scant dataset. Hence the 'artifact' potential is HIGH. As in THIS instance. That you don't even question your 'belief', in the inerrancy of the techniques and the people involved in such tenuous scenarios, is disturbing on many levels. It's this kind of self-reinforcing 'groupthink' and uncritical 'religious disciple' like acceptance of all that issues from mainstream sources that DESTROYS credibility. Why give such 'ammunition' to detractors by such unjustified 'certainty'? i called it! i knew you would cry and blah blah blah with irrelevant self pity comments! Pick whichever cosmological model you like, even your personal "Theory of Everything": As a datapoint, GN-z11 is a current record holder no matter how you view it. In your ToE it would apparently hold the record for greatest misinterpretation of distance. you aint got none, that is why you whine ..
want it to stop and people treat you like a serious science advocate? You miss the point still. If the image is a composite of a range of shifted photons from a range of photon sources between 'here' and the furthest reaches of the universe which this purports to represent, then any 'shift' value is GIGO. It could be a resultant 'value' of the superimposed 'stream' of the few shifted/attenuated photons which were received 'here' but which could have come from anywhere 'in between' here and there. Your confirmation biased assumption that it actually is a definitive value for a definitive object at a definitive distance is leading you to believe what you want to believe. A compound-image from line-of-sight contributions is more likely. CapS, please stop your noise. Hush. Your confirmation biased assumption that it actually is a definitive value for a definitive object at a definitive distance is leading you to believe what you want to believe. It's a complex set of many values; photometric, spectrographic, etc. A compound-image from line-of-sight contributions is more likely. In your ToE it would be a compound-image from line-of-sight contributions that happen to resemble a surprisingly luminous galaxy with the mass of a billion suns and a record setting spectrographic redshift measurement. As Ira would say, Okayeei. stop posting pseudoscience phishing sites! CapS. Please stop your noise. Let it go. Hush. But what is it of? If it's of a line-of-site composite photonic melange 'artifact' smudge, then no amount of those techniques can tease out any ONE object/source to apply a shift-related distance estimate to. Even IMP-9 made that point. In your ToE it would be a compound-image from line-of-sight contributions that happen to resemble a surprisingly luminous galaxy with the mass of a billion suns and a record setting spectrographic redshift measurement. The whole point is that techniques used which you mention for 'sky noise' etc is not so dependable when treating vast distances/low photon counts. The techniques depend on algorithms and statistical averaging treatments which fail due to paucity of data points. No. Firstly distance has zero relevance. Secondly you have loads of data points. When measuring the sky your data points are the pixels of which you have a vast number over the GOODS area. If you even bothered to look at the paper you would see an example of background analysis where they show their background is indeed Gaussian. This proves your claim wrong. You're just making up claims as you go along. Your idea simply doesn't work no mater how many times you emptily try to dismiss the methods used in data reduction. I never said that. Don't put words in my mouth. You are saying that a astronomers can not determine from which direction a photon comes. I was crushing the blues shift argument. Ok. I was talking of the problems of the current "Cosmic Distance Ladder" steps, and its increasing unreliability as distances get to many Billion LYs; especially when it goes to edge of visible universe. The blue shifts are a separate issue which can only be settled for far-to-farthest galaxies once we have more reliable distance determining methods and 'cleaner' shift info which takes more account of local conditions for those galaxies (whose size and mass and dynamics/speeds are being currently re-assessed in view of more recent astronomical discoveries which have shown differences for all sorts of 'objects' from Cepheids to Supernovae to Galaxies etc). Since I can see the Andromeda and the Magellanic systems with the unaided eye, they must be cosmologically near? When measuring the sky your data points are the pixels of which you have a vast number over the GOODS area. If you even bothered to look at the paper you would see an example of background analysis where they show their background is indeed Gaussian. The pixels don't 'know' the source or space=traversal history of the sporadic photons which build up the 'intensity' values enough to create that datapoint/pixel value over a certain threshold value. So that is no basis for 'conclusions' unless 'assumptions' are made and confirmation bias enters the 'analysis'. You agreed no info can be obtained from those sporadic photons re sources (ie, front? behind?). So far Really-Skippy is winning this game. The object of the game is to see how many times he can repeat the same thing over and over and over without adding anything new and still get somebody to play with him. Silly game I know, but I suppose he gets some joy out of him. The astronomers claim a light source with a very high photometric red shift. If instead they see an "intervening source" (whatever) then that source has a very large photometric red shift, so is very distant. All that is changed is that what they state is a galaxy, you call an "intervening source". Also, intervening between us and what ? That is another misunderstanding of what I have been posting in context. It's not a question of just 'one' intervening source. It's about the line of sight VAST expanse of space which is replete with INNUMERABLE stellar, planetary, clouds (gas, plasma, dust, magnetic/electric processes/fields, gravitational wells and Lens Thirring accelerations/decelerations etc). See? How you are Cher? As usual I see. I am doing pretty good me, thanks for asking. And none of the times could say what they got wrong, only repeat the thing you got wrong. You misunderstood because you don't read, otherwise you would have addressed their comments instead of repeating the same wrong thing over and a bunch more overs. The pleasure is always mine Cher. In other words, everyone calm down and stop the personal attacks, and stick to the science: They're just points of light in the night sky that we can never be certain about, and when I publish my ToE it will explain/answer everything, plus lots of extra things, and it will save the science/physics world/universe. And this whole gravity wave thing has made my work much more urgent, so I don't have time to say anything now. But here's another two dozen 1000-character comments packed with impressive word salad. Which, again, is completely irreverent. You're just repeating yourself again no matter how many times this has been explained to you. You attempted to dismiss sky statistics and failing in that you've just reverted to the last thing you asserted. So that is no basis for 'conclusions' unless 'assumptions' are made and confirmation bias enters the 'analysis'. Those "assumptions" were verified in the paper as I said. Unlike you they have actually taken the time to test their claims. This discussion is going absolutely nowhere because everything that is being said to you goes in one ear and out the other. You have no understanding of how photometry is done but feel qualified to blindly assert everyone in the field inside and outside astronomy is doing it wrong. I don't mind correcting people but I'm not going to argue with someone who's clearly not listening. In other words, everyone calm down and stop the personal attacks, and stick to the science: They're just points of light in the night sky that we can never be certain about,.. Your continued misrepresentation based on your own obtuse/intentional 'misundersatnings of what I said, proves you are not a genuine scientific discourser. You are another ignorant-arrogant troll who is more into denial and ego games than science with an objective mind. Maybe it's time you changed your 'shtick'. Or better still, maybe it's time you actually learned scientific discussion based on science. But that will require you to jettison your bot-voting and silly gaming. What odds that either will happen? The disrespect and ridicule sticks very securely to its source if that is all you can do on a science site. Podna. RC........he doesn't have anything else to do. You wouldn't want to deny him his one reason for living would you? You are so cruel seeking to deprive a body of their one reason for living, coming to this site & talk inane nonsense just so he can feel important to himself & relevant in a technological world that left him behind a long, long, time ago while he still dawdles around with ham radio. ... You have no understanding of how photometry is done but feel qualified to blindly assert everyone in the field inside and outside astronomy is doing it wrong. I don't mind correcting people but I'm not going to argue with someone who's clearly not listening. It is the WHOLE analytical methodology being used at ALL stages of photometry etc applied to sky. Tell me how is it wrong then. Be specific. How is are the methods flawed? Well how you are again Cher? I'm still good, thanks. Alrighty-roo Cher. Apology accepted. I am going to try to watch a couple of my Leverage videos and grab a couple of hours of sleep before I go on watch again. So you can do your diligence without me for awhile, eh? And just because I am not here, don't think I won't find out if you start disrespecting the scientists and humans again. If you do, I am going to be forced to come back to defend against your dishonor. More like a tripled quadrupled quintupled postum, never slowed you down before, why now? Do you realize what you are asking? I'm asking you to back up your assertions, it's quite simple unless you're talking nonsense. Your reply however tells us all that your previous assertion was completely baseless. You claimed to know of a major flaw in distance measurement. Your pet idea of unresolved sources was trashed by hard results but you couldn't accept that. Now you simply claim the analysis may be incorrect to save your idea. A completely baseless assertion to back up your other assertion. Claiming "there could be a problem somewhere but I don't know where" is not evidence there is a flaw in observational cosmology. BICEP2 doesn't use any of the same analysis. They had to model their foreground, unlike photometry of galaxies they couldn't just measure it. Well this has been a monumental waste of time. I thought you might listen to logic but I guess I was naive. BICEP2 shows how well peer review works, which builds confidence, and with LIGO's recent direct detection of gravitational waves, there's good reason to be excited about BICEP3. Same with our (not your) improving understanding of refining cosmic distance measurements. We'll (not you'll) rethink it a third time, and a fourth and fifth and so on, because that's one of the things we like to think about. Most of the time. It's sorely evident you're (not we're) the one with the confidence problem. Do Better Diligence until I get back Cheery Matey. (:(,):),(:(,):) (That last part was me making the funny faces at you all in good fun. I think I've seen that before, it's "smile, wink, nudge, nudge, know what I mean, know what I mean?" Proto and Ira won the Internet today! i've been trying to get the 4 fatal flaws out of him for something posted YEARS ago... and the closest i've came is him saying to "let it go. i won and proved myself"
get ready for a few years of "let it go. i won and proved myself"
CapS, please stop your noise. Let it go. Hush. what i wonder is: if it is SO obvious, and it is clearly something you can prove, why have you posted more than 2000 posts without ever posting the flaws, ever posting any links to evidence or making even a single claim that can be corroborated with links/evidence here on PO? @ Captain-Skippy. How you are Cher? I am good me, could not be better without feeling guilty about it. I am wondering what place he has been that he is banneded from now. He usually only spends this much time here after he does one of his "experiments" and gets the boot-a-roo because it "proved" he is a couyon. and i hereby challenge you to produce the EVIDENCE that you stated you saw, from the 4 fatal flaws to the other 4 flaws that every scientists on the planet but you missed. need i remind you of the Nov 23, 2015 AA_P football analogy made about your claims in the below thread? I am wondering what place he has been that he is banneded from now. it must have been a site with a moderator ! [...cont @IMP-9] Anyhow, I'll try one last time, as I haven't much more to spare this attempt to get you to rethink objectively instead of being stubborn/reactionary to my cautions re confirmation bias 'certainties' and flawed 'exercises' and 'methodologies' etc which sustain such false sense of 'certainty' even against new astronomical discoveries. Firs, let me ask you: did you understand the problems with Cepheids, Supernovae, galaxy observational assumptions/interpretations which their newly found 'variability' and uncertainty' as to actual validity of E-M 'data' previously used in the methodologies/hypotheses? Those problems become multiplied exponentially for 'imaging' that 'furthest galaxy' in the above article. Consider. We are just beginning to find more radiating 'clouds/objects' even a few thousand/million LYrs away! Imagine how many MORE such previously (and still!) indiscernible clouds/objects there must be between us and that 'furthest galaxy'! does that mean you will leave and go tell someone else how stupid all of us are because we actually want you to produce evidence of your claims? PS - you have posted thousands of times since your initial claim of "4 fatal flaws" and never once actually provided ANY evidence other than "because i said so"... but you want us to take you seriously? Imaging candles stretching all the way to the furthests edge if visible universe where a 'bright lamp' is placed but is by dint of farthest distance only very faint to our detectors. So, the nearer candles will be easily discernible and their photonic contribution 'removed' from the data as discernible foreground sources of light. Then the further intermediate and farthest candles, whose light is NOT discernible from 'foreground/background 'noise' will NOT be 'removed from data'. Hence these un-attributed/unsuspected photons ALL THE WAY from there to here along that 'line of sight' will CUMULATIVELY OVERWHELM ANY light from that 'bright lamp'. Now back to that 'furthest galaxy' claim; ask yourself: What is the basis for assuming there IS ANY such galaxy THERE at all (ie, 'bright lamp' stand-in)? That SMUDGE!---built up from sporadic individual photons, most of which may have come from 'line-of-sight' sources (ie, indiscernible 'candles')! Now, IMP-9, the whole point is that many of the certainties, standards, methodology confidence levels have been unjustified in fact. Consider: Even the DARK MATTER certainties/claims based on naive interpretations of prior INCOMPLETE observational information due to telescope limitations which have been improving in recent years. Many of the 'clean' assumptions which astronomers/theorist used to quantify the baryonic matter DECADES AGO when formulating said hypotheses/conclusions/claims was SEVERELY CONSTRAINED and did not actually represent reality AT 'locations' observed. Now X-Ray, Far/Mid INfrared etc telescopes finding NEW Baryonic matter UNSUSPECTED til recently; whose gravitational effects had IGNORANTLY been MIS-ATTRIBUTED to 'weird' NON-Baryonic DARK MATTER. Now we KNOW of HUGE quantities of gas/plasma/dust/stars/systems Baryonic MATTER QUANTITIES which DWARF previous Baryonic estimates made when 'galaxy rotation curves' were examined. So you see, IMP-9, I am speaking from UP-TO-DATE mainstream astronomical data and discoveries which SUPERSEDE and make OBSOLETE and IRRELEVANT all prior assumptions, hypotheses, interpretations, conclusions and claims based on OLD information about what IS out there and how easily we can be fooled into thinking our methods are all valid ACROSS time and circumstances which have CHANGED DRASTICALLY since those stances and certainties and confidences which you and others exhibit here were formed in the minds of 'researchers' who did not know even the half of what was out there which WAS BARYONIC but easily misinterpreted using methodologies/techniques but allowing for full REALITY. Using statistical methods, spectroscopic analysis and data 'refining' etc is DANGEROUS when you don't have ALL the necessary data to make the exercise ROBUST. CapS. Spinning new lies and fantasies about me again, mate? Haven't you learned yet? I haven't been banned from anywhere for a long time now. It's all in your deficiently equipped headspace, CapS. Don't keep digging holes for yourself to fall into with great embarrassment as before. Let it go. And stop your noise posts which clutter up my discussion with IMP-9 with your fantasy world rationalizations for being wrong about me and everything to do with me. Cluttering up threads with your off-topic personal rants and noise is anti-science agenda at its worst. Let it go. Hush. Spinning new lies and fantasies about me again, mate? can you prove, WITH EVIDENCE, that what i said is not correct? well, if this is true, you can demonstrate, WITH LINKS AND EVIDENCE, where i've been proven wrong by you, correct? thanks, chronic lying trolling wanker! and troll with pseudoscience you call a "ToE"
i will HUSH as soon as you can actually prove any of your arguments with evidence. You 'found out' nothing. My internet experiments proved why I was banned. Mod-trolls colluded to frame and ban. One mod left in disgrace and the troll banned. You were informed of this truth long ago. But you keep re-hashing your same lies and denials of the record. Sad, really. Surely you must be close to filling your daily quota of thread cluttering noise posts for today? If you have filled your quota, then hush, child. thanks for validating my claim ONCE AGAIN! Whatever you say, child. We all heard your rant the first umpteen times. Now hush your noise and stop cluttering up threads and annoying the forum. Go be "professional" somewhere else where your kind of "professional" behavior in internet stalking, bot-voting, lying and denying is appreciated, CapS. i can provide evidence of your lies, you can't even provide evidence that you were telling the truth! thanks for validating me ONCE AGAIN! Hush now. Dream on, "professional" child. SO, your tactic is to simply keep repeating this till either you get the last word or you get banned for not being able to prove yourself?? - because the MODS will eventually get tired of watching you cross-post spam and trolling content without evidence, you know! Sure, as soon as you can produce the evidence supporting your claims of 4 fatal flaws in BICEP as well as the proof that you have posted this in the past "proving" yourself! Feel better now, mate? How about we all get back to on-topic science discussion and leave out the off-topic personal stuff? Do you have any on-topic science comments relating to the science aspects associated with the article subject/discussion in this thread? Thanks.